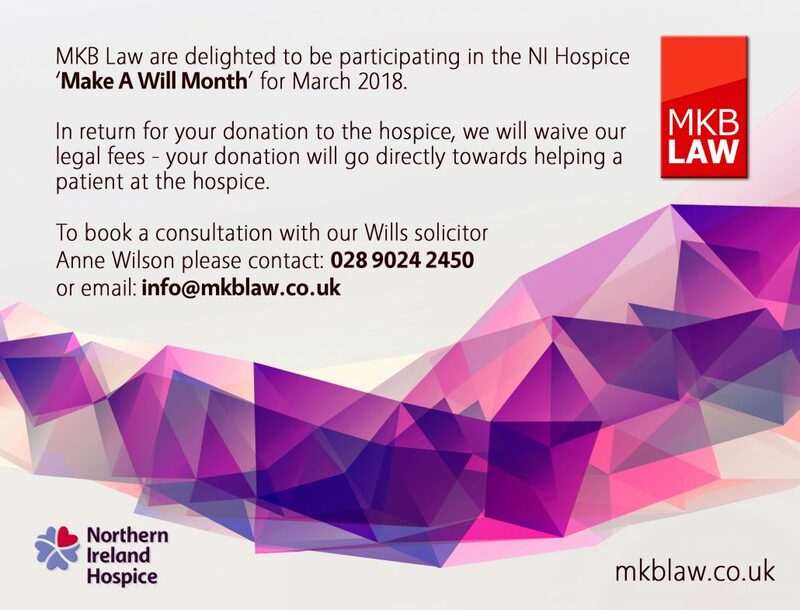 The Northern Ireland Hospice is holding their “Make A Will Month” campaign during March 2018. MKB Law are pleased to be participating in this campaign and will offer clients a standard Will writing service free of charge, in return for a donation to the Hospice. The Hospice cares for over 3,500 local adults, children and young people with life-limiting and life-threatening conditions. Although all of these services are provided free of charge, the annual running costs of the Hospice are over £9 million – making charitable donations and legacies an important source of income. The aim of the campaign essentially twofold; to raise much needed funds for the Hospice, and to highlight the importance of having a Will. In 2016/2017 for instance, 54 people left a gift in their Will to Northern Ireland Hospice. The suggested donation is £80 for a basic single Will, or £125 for a pair of basic mirror Wills. These costs not only represent a significant saving to you, but will go directly towards helping the life of Hospice patient. MKB Law is delighted to be working in association with the Northern Ireland Hospice. In return for a donation to the Hospice, MKB Law will waive the fees connected to the preparation of your Will.